Just in time for summer (it is still coming right??) 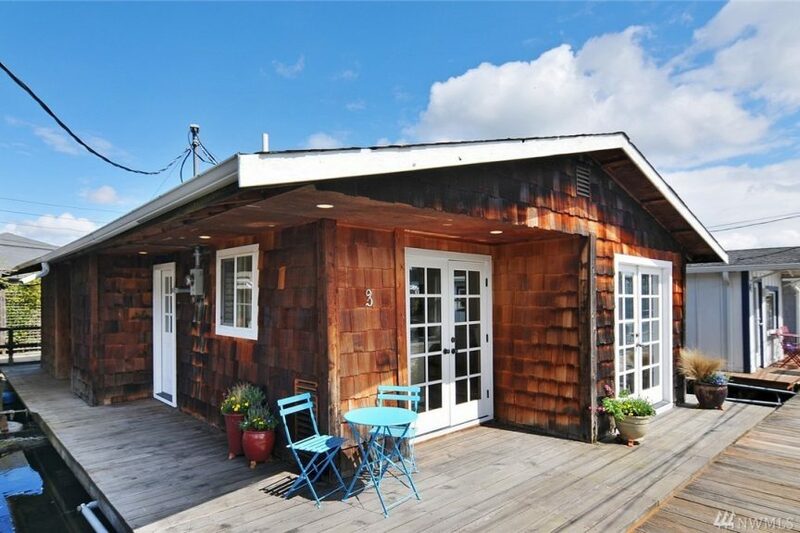 is this cute floating home on Portage Bay at 818 Boyer Ave E #3. At a 1,000 square feet it has two bedrooms and a bathroom with a Japanese style soaking tub. Note that for $749k you’re buying the floating home, but not the slip. You’re renting the slip for $750/month. Seattle floating homes are historic gems. This one was built in 1914 and floats on the original logs. A heart and soul complete renovation in 2008 turned it into a stunner. When you live on a floating home, every foot is important so when this home was remodeled we made sure the floors would feel soft, smooth, and sweet on feet. The bathroom floor is made of river stones, and (like the rest of the home) it is heated from beneath with radiant floor heating. The main floors are wide Ash hardwoods, worn to perfection. I have to say it is one of the nicest things come winter, to wake in the night and tiptoe around barefoot. Warm, cozy. And the Japanese style soaking tub we built ourselves from limestone and sea glass, added a third skylight and a small chandelier above it so we could gaze at the stars from the tub. When the rains come and wind blows, floating homes rock ever so gently on lake waves. This home is secured to the dock with three robust mooring arms, designed and handcrafted by Rob Marsden, a floating home old-timer. He made them for us out of leftover steel ball bearings and airplane parts he picked up from Boeing, up in Everett. They keep the home steady, but it still sways juuust a little in the wind. When it does, the pretty hanging lights over the kitchen bar sway gently too. It is a romantic way of life, moving with water. I love making art in the cozy extra bedroom, with light dancing on the ceiling reflected off the water, then dropping our kayaks into the lake off the back deck and paddling over to the arboretum for the afternoon. Sometimes we would paddle to Aqua Verde for dinner, or Lake Union to catch fireworks on New Year’s Eve. Paddling back home always feels so good, too. We’d just land on our deck and hop in that amazing tub to warm up. Listing provided courtesy of Andrew Mellon, Lake & Company.